On December 22, 2017, the President of the United States signed into law the Tax Cuts and Jobs Act of 2017 (“TCJA”), which significantly overhauled the Internal Revenue Code of 1986. The ink on the President’s signature had barely dried on the TCJA before consumer advocates and wholesale customers started demanding that any benefits resulting from the TCJA be passed to utility ratepayers. A key component of the TCJA is the change to the corporate income tax rate from the current statutory rate of 35% to 21%. The change to the corporate income tax rate took effect on January 1, 2018, and is permanent with no phase in period. Wholesale customers that take service from utilities that are under the jurisdiction of the Federal Energy Regulatory Commission (“FERC” or “Commission”) through approved formula rates are concerned that the existing formula rate templates will not properly account for the full effects of the lower corporate tax rate. Indeed, these concerns are not baseless as most existing FERC-approved formula rate templates will not fully account for the impacts of the corporate tax rate change. Unless these formula rate templates are modified to consider all effects of the tax rate change, customers will not reap the full benefits of the lower corporate tax rate, and stockholders could potentially be the beneficiary of the windfall. For those wholesale customers under “stated” rates, typically, there would not be any mechanism in place to automatically allow for adjustments to the stated rates to account for changes in tax rates. However, even with stated rates there are certain options available to customers that would allow the rates to be adjusted to reflect the impact of the lower corporate tax rate. For most formula rates, the corporate income tax rate is an input to the formula rate template that can be updated similar to the FERC Form 1 inputs. Therefore, the reduction to the corporate income tax rate would flow through the current income tax expense calculations and result in lower income taxes and a corresponding lower revenue requirement. The impact of just the 40% decrease in the corporate tax rate (from 35% to 21%) will be significant for wholesale customers. A random survey of ten FERC-jurisdictional utilities with transmission formula rates indicate that the decrease in the transmission revenue requirements for those ten utilities are on the average 8.5%. This decrease does not take into consideration the secondary effects of flowback associated with excess deferred income taxes, which is discussed further below. Given the general nature of the utility business, there are inherent timing differences between the period in which certain expenses and revenues are recognized for income tax purposes versus when they are recognized for book, or ratemaking purposes. In other words, the income taxes paid to Federal and/or State taxing authorities are typically higher or lower than the taxes charged to ratepayers. When the timing differences cause taxes payable to the Federal and/or State taxing authorities to be less than taxes that are allowable for book, or ratemaking purposes, the difference represents customer contributed cost free capital that can be utilized by the utility as it deems appropriate. 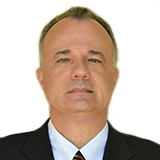 However, for FERC ratemaking purposes, utilities are not allowed to earn a return on the accumulated difference between taxes paid and taxes allowable, referred to as accumulated deferred income taxes or “ADIT.” Rather, the accumulated difference is treated as an offsetting credit to rate base, which effectively reduces the resulting revenue requirement and rates to reflect the investor-owned utility’s use of the cost-free funds provided by its customers. In order to properly account for the decrease to the corporate income tax rate, utilities will need to make certain adjustments to the balances for income taxes accrued and the balances in ADIT and reflect a flowback of the excess deferred income taxes in rates. For Federal or State Income Tax rate changes, FERC has provided guidance in prior dockets, Commission orders, and under the requirements set forth in 18 CFR 35.24 on how to properly account for such tax rate changes. This guidance requires that utilities follow the normalization accounting rules method to return the excess deferred taxes, or excess ADIT, to ratepayers that result from any change in either the Federal or State Income Tax rates. Under the normalization accounting rules, utilities would transfer the excess deferred taxes to ratepayers through reductions in utility service rates over a period that is no longer than the remaining economic life of the capital assets that generated the deferred tax reserves. In order to apply the normalization rules to formula rates, certain changes will be necessary to the inputs and income tax calculations. Specifically, the utility will need to create a regulatory liability for the difference between the prior income taxes accrued at the 35% tax rate and the new 21% tax rate (recalculated income taxes accrued). The previously deferred income tax payable related to the plant depreciation, or other things that give rise to deferred taxes, would now be the regulatory liability. The utility would then be required to request FERC authorization to amortize that regulatory liability and to include the related amortization as an adjustment to income taxes for the flowback of the excess deferred income taxes. As the regulatory liability is amortized, the related ADIT would be reduced accordingly. Since most formulas do not have a component in the income tax calculation to account for flowback of excess deferred taxes, the formula rate templates will need to be modified in order to effectuate such change to the income tax calculations. The change to the formula rate template for the flowback of excess deferred income taxes will require the utility to make a filing at FERC, unless the utility’s formula rate template already has such mechanisms in place that were previously approved by FERC. The utility should also be required to include the related ADIT balance as a reduction to the rate base, since these excess accumulated deferred income taxes payable are equivalent to cost-free capital provided by customers. Again, the related ADIT balance will be reduced as the regulatory liability is amortized and the flowback of the excess deferred taxes is reflected in the income tax calculation. The actual impact of the flowback of the excess deferred income taxes will vary significantly between utilities depending on a variety of factors, but most importantly on the remaining economic life of the capital assets that generated the deferred tax reserves. Given that the net impact of these additional adjustments is expected to result in a further decrease to the revenue requirements and rates of utilities, customers should support the implementation of these additional adjustments to the formula rate templates. Furthermore, it is in the customers’ interest that these changes to the formula rate templates be implemented expeditiously so that they can start reaping the full benefits of the decrease to the corporate income tax rate, which is effective January 1, 2018. Consumer advocates have publicly expressed their concerns to FERC regarding the impact of the corporate tax rate change on formula rates. 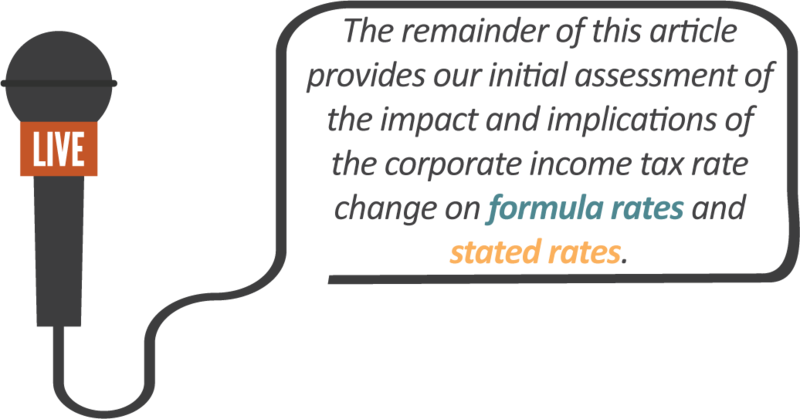 It is widely anticipated that the Commission will soon take action and provide some guidance on how formula rates are to be updated to reflect the lower corporate tax rate. Absent such guidance from FERC prior to the course of the 2018 annual formula rate updates, utilities should at a minimum update the corporate income tax rate input in their formula rates which would thereby allow some of the benefits of the lower tax rate to flow to ratepayers. In addition, utilities should revise their formula rate templates to reflect the ADIT impacts and flowback of the excess deferred income taxes. Depending on the timing of the formula rate updates and the revisions for the effects of the flowback of excess deferred income taxes, the full impacts of the change in the corporate tax rate may not be realized until the 2019 formula rate updates and true-ups. Wholesale stated rates (including stated revenue requirements and fixed charge rates) are typically the results of negotiated “black box” settlement agreements. Unless FERC directs otherwise, the change to the corporate income tax rate should not impact existing stated rates (e.g., production, transmission, and ancillary services) that are currently in effect. Of course, the utility or the effected customer(s) can always make a filing at FERC that seeks to change the existing stated rates to reflect the effects of the corporate tax rate change. If the utility does not make a filing at FERC to revise its stated rate for the corporate income tax rate change, the utility should still establish a regulatory liability on its books for the excess accumulated deferred income taxes payable. The regulatory liability would remain on the utility’s books until its next rate proceeding, at which time the utility should request the amortization of the regulatory liability and all the associated rate impacts. If the utility does not revise its stated rate nor create the regulatory liability, then the utility will most likely write-off the excess accrued deferred income taxes payable to income and receive a windfall, all to the detriment of ratepayers. Obviously, it is not in the utility’s financial interest to make a filing to lower its stated rate unless they are required to do so by FERC. Therefore, customers will need to decide whether it makes sense to exercise their rights under the Federal Power Act to make a filing at FERC that seeks to change any stated rates that they are obligated to pay under an existing arrangement. Alternatively, customers can wait for the utility’s next rate proceeding at which time the new corporate income tax rate and, hopefully, the regulatory liability will be reflected in the revised rates. GDS is currently in the process of assisting its clients sort through the impacts of the changes to the corporate income tax rate on their wholesale rates. GDS reviews dozens of formula rate updates annually and our team of experts understands the complexities and implications of tax rate changes on utilities’ costs-of-service.